Firstly, a recap of the last weekend for Rangers Football Club. It is a situation so fluid that even as I write this, circumstances are changing. Embarrassingly knocked out the League Cup in the first round to lowly Forfar Athetic, many believe Ally McCoist’s time is up. Whilst he was unable to field any new signings, this side should have been more than good enough to beat the part-timers of Forfar. The positive signs and feel good factor of pre-season is all but eradicated. But despite this humiliating result, there is a bigger picture to look at here. Charles Green returned to the club on Friday in what is described as a ‘consultancy role’. One of his first acts in this ‘role’ was to run to a tabloid and claim that McCoist “had to win a league and a cup”, that he “would never have sanctioned the number of signings McCoist’s made” and reiterated his belief that last seasons Rangers side was ‘the worst Rangers team ever.’ McCoist understandably blasted these remarks made about him and his side, and it is clear him and Green are not friendly. Just hours after the announcement of Green’s return, Rangers revealed they had received a request for an EGM, with the proposal of removing members of Charles Green’s consortium including Bryan Smart, Brian Stockbridge and Craig Mather, and replacing them with Paul Murray and Frank Blin. Confused? I don’t blame you. So let’s break it down. Rangers looks to be subject to a takeover once more. Charles Green’s consortium has done it’s job, it has raised in excess of £35m through IPO money and season ticket sales, which have actually increased this year. Green and his chums are pocketing very healthy salaries from this cash, but they have spent a huge amount of it. According to some newspapers, only around £15m remains in the bank and this is being consumed at an alarming rate. Best guesses are that Rangers will run out of money sometime around this seasons midway to end point unless extra capital can be found. Hence where the takeover comes into play. Charles Green and co will make their money via the sale of their shares, and will be millionaires for it. The request for the EGM is believed to come from Jim McColl, a man worth £800m and who is thought to have the backing of 30-40% of the shareholders at Ibrox. Paul Murray was Rangers finance director under David Murray, and Frank Blin was executive chairman of PwC in Scotland, a hugely reputable accountancy firm. Their job will be to examine how bad the state of financial affairs is inside Ibrox before reporting to McColl just how bad the situation is. But whilst McColl may have his sights set on good corporate governance and financial stability for the club, he is not thought to want to invest a huge amount of money. Dave King has long been mentioned as a potential buyer, and he is someone who Paul Murray knows well. The pair of them is a plausible scenario. Meanwhile, Green’s consultancy role will undoubtedly be to try and find another buyer in order to help raise the share price for when he does sell. It is sitting around 41p right now. Buyers value it around the 35-40p mark according to newspapers, so this could also be a last ditch attempt to raise the share price. And as for the McCoist – Green spat through the press? Well, McCoist and ex-chairman Walter Smith are close friends, and Smith formed part of McColl’s takeover team when he originally tried to buy the club. It is yet another symptom of the soon-to-be ongoing negotiations between the sides at Ibrox. 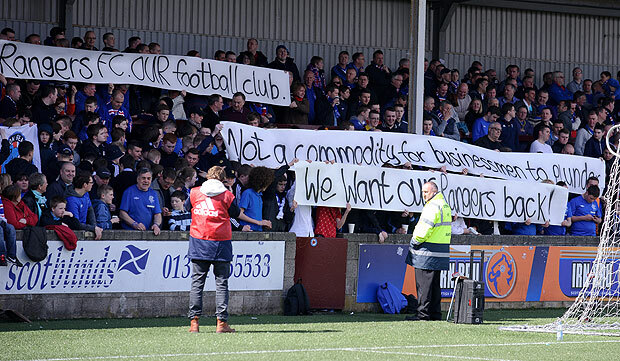 Rangers are already sold, that much is clear. The original consortium cannot and will not fund the clubs losses. The ongoing tussle that will emerge in the papers is just to determine two things: Who will buy and how much for?